State and federal law officers searching for two killers who used power tools to break out of a maximum-security prison in upstate New York poured into a small town 30 miles away Tuesday after getting a report of a possible sighting. Dozens of officers with arms linked pushed through woods and fields in the town of Willsboro in an apparent attempt to drive their prey toward a road in a neighboring community. The road was lined with officers with rifles. State Police Capt. John Tibbitts Jr. would not say if authorities believed they were closing in on the inmates. The officers descended on the town just west of Lake Champlain after residents reported seeing a couple of men walking on a road late Monday during a driving rainstorm. Investigators are looking to see if civilian employees or private contractors helped two murderers get power tools to escape from a maximum-security prison in upstate New York over the weekend, Gov. Cuomo said Monday. Marc Santia reports. Authorities have fielded numerous tips since the weekend escape from the Clinton Correctional Facility in Dannemora, close to the Canadian border, but appeared to have jumped hardest on this one. 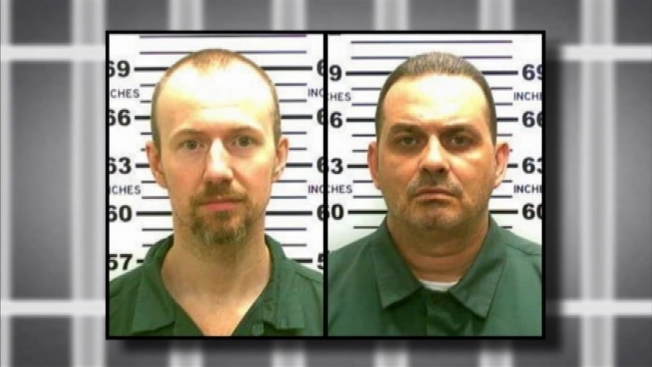 David Sweat, 34, and Richard Matt, 48, cut through a steel wall, broke through bricks and crawled through a steam pipe before emerging through a manhole outside the prison grounds. They were discovered missing early Saturday after stuffing their beds with clothes to fool guards on their rounds and leaving behind a taunting note: "Have a nice day." Given the meticulous planning that went into the breakout itself, there was speculation that the inmates had lined up a ride for themselves outside the prison and were long gone from the area. On Monday, authorities said the inmates could be anywhere — perhaps Canada or Mexico. On Tuesday, Willsboro dairy farmer George Sayward said he saw troopers parked next to his barn around 5 a.m., and they told him they were there because of a possible sighting of the convicts. Around 7 a.m., Sayward said, he heard one trooper tell another to call in 100 more men. "The next thing I know, there were a ton of them, by the busload," Sayward said. The escape from the 3,000-inmate state prison immediately raised suspicions the men had help on the inside. On Tuesday, authorities questioned a civilian worker who teaches inmates how to make Metro-North Railroad uniforms as a person of interest in the escape. A government spokesman confirmed to NBC News that investigators spoke with prison tailor shop instructor Joyce Mitchell about how Matt and Sweat broke out. The spokesman said that Mitchell is not technically in custody, but said she checked herself into a local hospital with "a case of nerves" the day the two killers carried out the brazen, movie-style escape. Mitchell's son said Tuesday his mother would never have helped the prisoners escape. Meanwhile, searchers from several law enforcement agencies in at least two countries continue to search for the men and run down hundreds of leads and tips about their whereabouts. A $100,000 reward was posted over the weekend for information leading to the men's capture. Sweat was convicted in the 2002 Broome County killing of a sheriff's deputy and was serving a sentence of life without parole. Matt was convicted of killing a man there while on the lam after being accused of dismembering his Buffalo-area boss in 1997, the crime for which he was serving 25 years to life. Matt also escaped from prison in 1986 and was deemed so dangerous that snipers were stationed atop the courthouse during his trial for the 1997 murder.